Yep, we always try to act serious, talking of TCP/IP stack, buffer overflows and latency even with girls we meet at the cocktail lounge. But since we like to be honest with our readers, we love video games too and we should also admit that whenever we had the chance to see Steam, the famous video game downloader and installer, at work on our friends’ Windows machines we have felt a bit envious. What a wonderful thing, isn’t it? No more scratched CDs that will never load, no more waste of paper. Click, pay and the game is up and running. Well, Ubuntu maniacs, let’s rejoice together because the Desura guys brought us the perfect and final solution for our Ubuntu boxes. Just install Desura and you will able to search, pay (not always, many games will come for free) and download, choosing your game from a very wide library of available titles which will run flawlessly on our dear Linux system. The service, which heavily relies on the Chromium framework, lets you download a very wide range of games, mostly games that are developed by independent software houses and also provides a huge amount of “free as in speech” games, giving the opportunity to thousands of independent developers to potentially reach millions of users. We downloaded some games and tested them out. 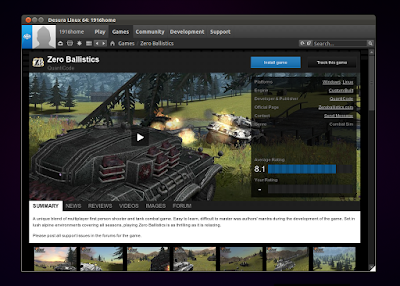 They all work flawlessly making Desura an almost MUST HAVE for Ubuntu users, especially if you are a gamer. There are not a whole lot of free games available, but there are some worthwhile free games like Triple A, Zero Ballistics and Smokin Guns. Many of the games that are for sale, do go on sale so its worth it to log into Desura often and check the sales. There are some great games you could pick up at great prices. And now we come to licensing. The Desura platform is “agnostic”, meaning that it will distribute whatever content developers want to distribute. So watch out, because developers may use never-insulted-enough copy-protection systems like the infamous DRM. As for the client, the Desura team announced that the client side of the application will be freed to enhance further development. Desura, which is at the moment available just for Linux and Windows, can be downloaded from the website of the project. It is easy to install by downloading the Linux tar file, extracting it and double clicking the Desura file. This will install Desura onto your system, putting an icon both on your desktop and in your Application > Games folder.